Comfortable, modern heating systems normally use water to store and distribute the warmth throughout your heating system. Water is the most efficient means of energy transportation and it is offered nearly for free by nature. But unfortunately water also contains aggressive minerals and gases that can cause damages to your heating system. Low operating temperatures in heat pumps and increased salt quantities in cylinders also place huge demands on the heating water. 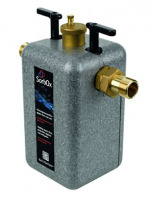 SorbOx is a result of over 40 years of research and development in water engineering. It combines major water treatment technologies in a unique way. SorbOx is designed to assist green technology in heating, and to keep any hydronic heating system running for as long as possible. Demineralisation of the heating water for initial filling or topping up. Reduces limescale deposits and sludge. This water treatment is now a requirement. Micro gas separator removes the oxygen and gases from the circulating water. Anode protection keeps the water constantly de-energised and ensures optimum heat transfer. Magnetic flow filter for the circulating water filters out sludge and corrosion particles. to prevent limescale, rust and the formation of gas. to prevent rust and gas.